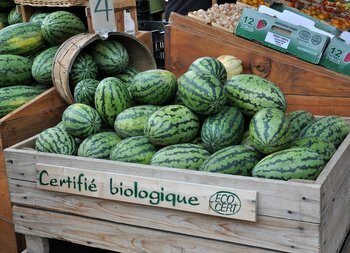 Montreal is a fun city for a weekend getaway, packing in plenty of beautiful and historic sites, as well as lots of good food. You could easily spend a week in the city, enjoying the slightly slower pace of life and the many festivals that they host throughout the year, but it isn’t always easy to take a long vacation and there are times when you need to pack a little more into a shorter time frame. Fortunately, while it isn’t always possible to try every great bistro in the city, it is very easy to try some of the foods that the city is best known for in a short time period. My foodie day in Montreal starts off with bagels. Montreal is known for their bagels and there is quite a rivalry between bagel lovers there and in NYC. 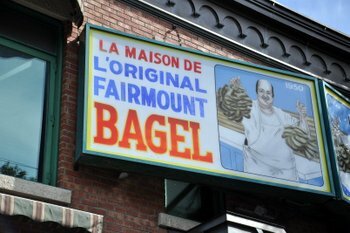 St Viateur Bagel and Fairmount Bagel (263 St Viateur W. and 74 Ave. Fairmount W.) are the two best places to pick up a real Montreal bagel. 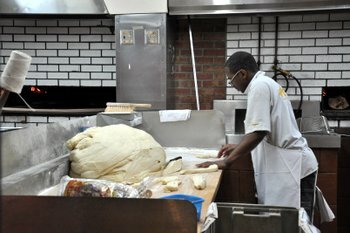 These two shops never close their doors and bake 24-7, 365 days a year. 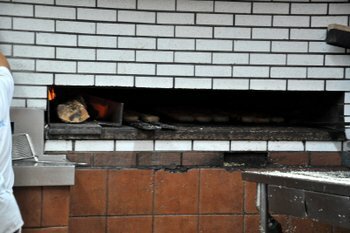 The bagels are all hand-rolled, boiled briefly in a slightly sweet wash, and baked in a wood-fired oven. 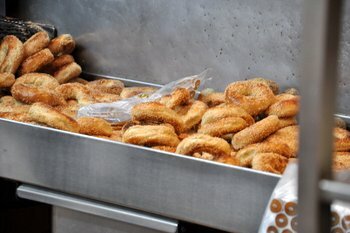 Both bagel shops have their supporters (I personally like the Fairmount bagels), but you can’t go wrong with a bagel that is straight from the oven at either place. You can pick up cream cheese or lox, but they don’t need anything when the chewy sesame bagels are still piping hot and fresh. You can also take your bagels to a nearby coffee shop and enjoy them with a latte. The bagel shops are so popular that places like CafÃ© Olimpico don’t mind patrons bringing in their own bagels to pair with their coffee. 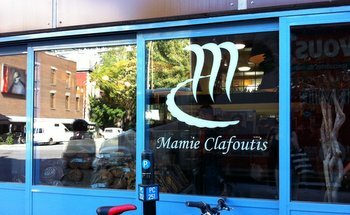 There are top-notch bakeries that do breads, pastries and vienoisserie to rival what you’ll find in France in Montreal as well, and Mamie Clafoutis (3660 Rue Saint-Denis) is a good place to sample some goodies. 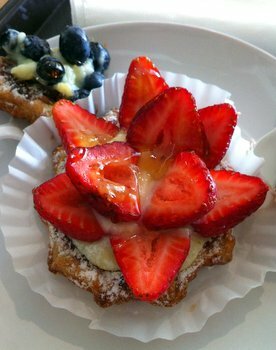 This popular bakery sells artisan breads, buttery and crisp handmade croissants, and all kinds of tarts and pastries. Everything in their pastry case is as fresh as can be, but they will sell out of some of their more popular treats in the morning, so it is worth getting an early start even though they restock the case during the day. The city is hilly, so while you can get around using the metro system or taking taxis, it is easy to justify stopping to have poutine for lunch if you’ve been walking around the city all day. Poutine is a French Canadian classic, a dish that consists of french fries topped with gravy and plump cheddar cheese curds. 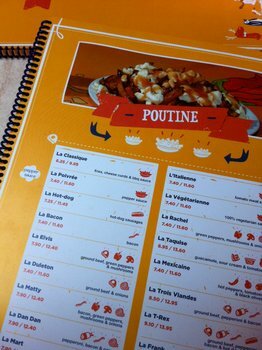 You can find it all over town, and there are classic versions, fast food versions and even gourmet versions (I’ve had poutine topped with duck confit before). 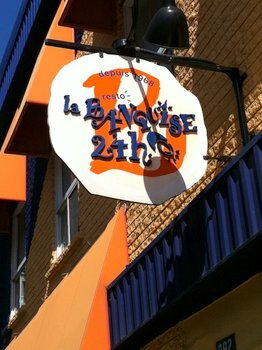 La Banquise ( 994 Rue Rachel Est) is definitely a landmark as far as poutine goes. 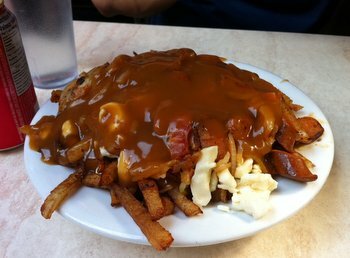 You can get the classic version, but there are also 20 other varieties of poutine with every topping you can imagine on their menu. The place is cash only and is always busy – fortunately, they’re open 24 hours a day, so there is never a bad time to stop in. After poutine, one final Montreal must-have is smoked meat. 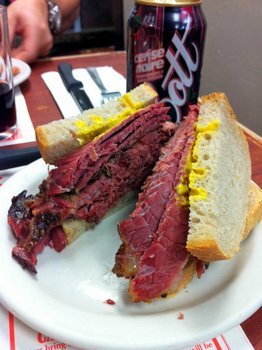 Smoked meat is a classic deli meat made by salting and dry-curing beef brisket for about a week, then hot smoking the meat and steaming it until it is falling apart and ready to serve. The meat is sliced thick and is so tender that it just falls apart as you eat it. 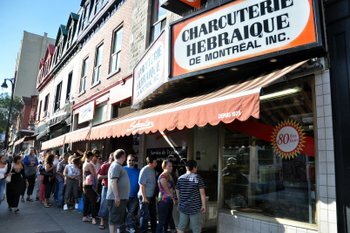 Schwartz’s Deli (3895 St-Laurent) is an institution in the city, and has been serving smoked meat since 1928. Their meat comes with options by fat content – lean, medium-fat or fat – and is served on rye bread with yellow mustard. The classic meal there also includes a house-made pickle, coleslaw and black cherry soda. The decor is nothing fancy, but there is always a line out the door, as pictured at the top of this post, to get in to have some meat. The service is fast and tables turn over quickly, however, so don’t worry if there are a few people ahead of you when you get there. 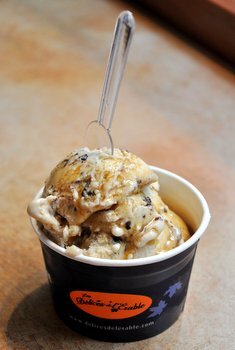 There are lots of great ice creameries in Montreal if you are looking for dessert – and if you have room for it – but since Quebec produces most of the world’s maple syrup, I think it is worth capping off the day with some maple syrup sweets. Canadian Maple Delights (84 Rue Saint-Paul E) in the Old Town is a shop that specializes in maple syrup and features ice cream, pastries and cookies made with only maple syrup and maple sugar – no white sugar in sight. Maple is fabulous on its own (and you can do a syrup tasting here), but is a fantastic addition to ice cream. Try maple chocolate chip with extra maple syrup on top and you won’t regret it for a second. Aw I absolutely loved Montreal when I went last November. Those treats look so good! I love poutine. What a great idea, gravy potato and cheese. So good. I have to say, I haven’t tried their bagels. I didn’t know they were sweet. I live in NY and we have a Montreal-Style bagel store. I thought it was an odd idea… considering NY bagels. But I’ll give it a try! Fab post! Great post about my city. 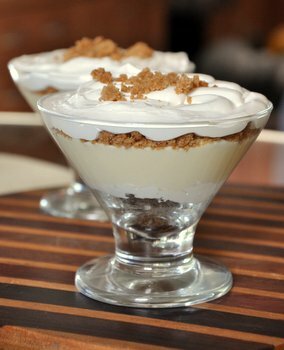 Next time, if you’re around the Old port, try Olive & Gourmando (http://oliveetgourmando.com/). 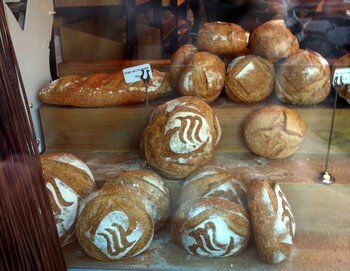 Great bakery, less choice than Mamie Clafoutis but superior products. Like Schwartz’s, it’s always full, even Bono couldn’t get a table. The Valhrona brioche is great, fortunately I don’t work/live close, I would overdose on sweet. Thank you for adding to my list. The maple place will be a must for my next visit. For your next trip make sure to go to Olivier Potier Artisan En Gourmandise at 1490, Sherbrooke Ouest/West. The desserts there are amazing and the service is welcoming. Is the famous steamed meat that Ruth Reichl writes about in her memoir Tender at the Bone, that she ate when she was a young girl going to a Catholic boarding school in Montreal? I’m in Ontario – about a 4 – 5 hour drive to Montreal. It’s funny, I’ve been saying all summer that we should go there. I haven’t been in a while. After looking at your pic of the deli sandwich – YUM – I can assure you, we’ll be going soon!